This page contains a basic overview of Tactical West’s CCW classes and what you can expect before, during and after! I HIGHLY recommend if you aren’t proficient with your handgun and need to learn how to use it, that you call me and we can discuss a pre-ccw class before you enroll in an actual CCW class. If you are taking the class at Bass Pro Shops, you will need to present your UNLOADED firearm at the main entrance, once the firearm(s) have been checked- in, please proceed to the escalator and take it to the second floor. Turn left at the gun counter, walk straight, past the gun range and you’ll see the Conservation Room. Your semi-auto and/or revolver for qualification. Nevada now only requires you to qualify with one type of firearm. Upon successfully qualification, passing the class and a clear background check, you will be able to carry both action types in Nevada once you have your permit in-hand. Minimum of two magazines for your semi-auto and two speed-loaders for your revolver. Speed-loaders are not required but will make the qualification process easier for you. Eye and Ear Protection – ear protection must be over-the- ear muffs. 60 rounds of quality, factory, brass case - range ammo. No reloads! A quality handgun cleaning kit with solvent, lubricant, swabs, brushes and rods. A good and clear, positive attitude to learn and ultimately strive to come away with a wealth of knowledge far above what you came in with! We start off with introductions, where the bathrooms are, objectives of the day, info about our minimal breaks and the tests you will be taking at the range and at the end of the day. I also pass out a liability release form for each student to complete and return to me that states you are being taught by Tactical West and are responsible for your actions on the range, in the classroom and once you leave the training facility into the real world. If you plan to get the Florida permit, visit freshfromflorida.com and download their application. Florida will require “1” fingerprint card and will take one that NV will sell you for them. If you plan to get the Arizona permit, visit azdps.gov, email their ccw division and request they send you an application packet. I recommend you do this before my class. Arizona will require that you get fingerprinted on “their” actual cards and you will want to do this when you process your Nevada application. Then, I start off with a nice display of very informative NRA and other educational and professional industry DVD’s. Some of the subjects covered include: Personal protection/color codes of awareness, firearm safety, home invasion/protection, concealed firearms, holstering and protection, use of lasers in self defense and much more. After the videos, I distribute an extensive double-sided Nevada Curriculum which is about 3” thick. This is yours to keep! Once the videos are over, we go through the Nevada packet identified above that was distributed. Initially, it will have an overview of my background and credentials thus putting you at ease that you are being instructed by an educated, experienced instructor that doesn’t believe in cutting corners. Thus, please be patient as this will be a long day. I also explain that we have a minimum of eight hours for Nevada and then additional time for the Utah permit as well. We will also be discussing your ability to apply for Florida and Arizona permits. Nevada is a “shall issue” state meaning we don’t have to provide a “reason why” we are applying for a ccw permit. Additionally, you’ll learn that is no law in Nevada that you have to tell an officer that you are carrying a concealed firearm; however, it’s highly recommended and I always tell my students to do so! That amongst a lot of other things we discuss, will vary state-to-state. In my class: We thoroughly go through the application process for NV/FL/UT/AZ, reciprocity & laws (I supply superior resources), resources where you gain info about carrying in each state AND their respective laws regarding such, join email lists to keep up with concealed carry and firearms law changes across the country, locations where you can and cannot carry, State Parks/National Parks, NV school firearm possession laws, justifiable homicide details, what’s concealed (on your person, in a car, etc. ), State Pre-emption laws, extensive gun safety (NRA Rules of Firearm Safety) is emphasized throughout the class, open carry, ammunition types - their uses and why, semi-auto vs revolver actions, holstering and holster types and options, Dennis Tueller 21- foot rule, cover and concealment, color codes of awareness, handgun types and selection for concealment, handgun jams and clearing them, misfire/hang-fires, squib-loads, stances (weaver vs isosceles & modified), grip, trigger squeeze, eye dominance, sight picture and alignment, follow through, different scenarios, what to do during a police encounter, range qualification standards and the safety processes that must be followed while we are on the range, we also clean our firearms once we get off the range to ensure proficiency in doing so – emphasizing that we must always make sure they are unloaded before we start to clean them. We also talk about deadly force always being a last resort, Castle Doctrine parameters, SB175 - passed and signed by Governor on June 2, 2015, brandishing laws, insurance available to protect you when carrying a personal protection firearm and much more. While this isn’t a complete overview, it gives you a good idea of our very long day! We have discussions about scenarios about being aware of our surroundings and brandishing their firearms and the consequences of doing so, we talk about how long your permit is valid if you are resident or non-resident, what kind of criminal history would preclude you from getting a permit and also what could get your permit taken away, the importance of the continuance of training after this class, we go through ideal shot placement, the Tueller 21 ft rule of an attacker and the amount of time it takes for them to assault you versus your reaction time, what you can do about it. We talk about accessories that will optimize your ability when carrying your firearm, type of weapon, laser sites, effective hollow-point ammo, types of holsters and that the use of deadly force should always be a last resort. You should always be looking for a way out and choose that option if at all possible! Students are given a 25 question test to work on in groups of two, it pertains to concealed carry concepts and methods. The answers are identified on each multiple choice question and the supporting article that backs-up that answer is also attached to the back of the set of questions. They are told to spend about 30-45 minutes working together on this thus making sure they understand the concepts. This test will be given to them again at the end of the class but the answers will not be given to them at that point. We also talk about the right to defend love-ones and people in their presence, but not having an obligation to do so but they should make sure they know exactly what is going on before they get involved in any situation. “They are not a police officer” and need to act accordingly. We talk about State Parks in Nevada as well as the law about carrying in National Parks that changed in Feb of 2010. While the above isn’t a complete curriculum of the Nevada course, it does give an idea of the subject matter discussed during the course. At the end of the day, students are given the 40 question State Test and the 25 question test that I talked about earlier. Once they finish, I have them trade tests with their neighbors and they take turns reading the questions and answers out loud while grading the tests. Then, if you chose to do so, we go into the Utah curriculum. Basically the same format as above. I will hand out the Utah packet which is similar to the Nevada packet that I went through above. A lot of what we already covered in Nevada will be seen again in the Utah curriculum. The nice thing is we’ve already watched the videos and did the range shooting that I require for this class. We have to go through the entire Utah packet just like we did the Nevada packet. If you take this class by itself, I will require you to shoot individually and take a written test. Upon arriving at the range, handguns are to be carried, unloaded and in a gun case or suitable container. A range bag containing your other range gear is acceptable. Firearms are NOT to be handled in any way except on the firing line unless you’re removing them UNLOADED from their gun case or container to place them on the shelf at the firing line. Leave ammo and loaded magazines or speed loaders in your range bag until you are actually on the firing line. NO EXCEPTIONS! The only place where ammunition and your handgun may be handled is on the firing line AND when under the direct supervision of your instructor. Your instructor and Range Officers will be observing to ensure that you keep your firearm muzzle pointed down range and keep your finger off the trigger until your sights are on-target and you are ready to fire. Violating any of these rules WILL be grounds for disqualification and possible dismissal without refund. “Cease fire”: If you hear “cease fire” at any time you are on the range, while keeping your muzzle down range and your finger off the trigger, you are to clear your firearm of any unspent rounds, lay your firearm down on the shelf, once again with the muzzle pointed down range and immediately step away. Then, await further instructions from your instructor and/or Range Safety Officer. “Range Is Hot”: All shooters and bystanders are to be wearing eye and over the ear hearing protection. Handguns and ammunition may be handled by shooters on the firing line only. 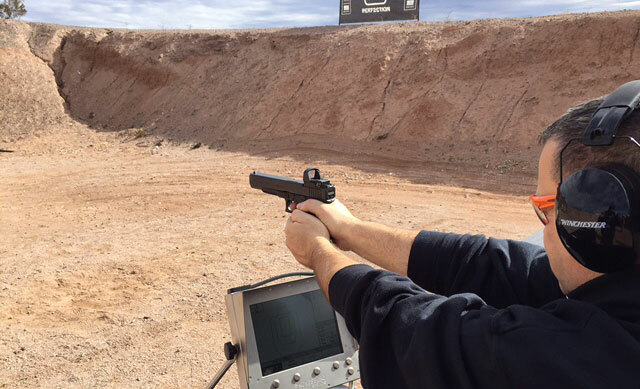 “Load and Make Ready”: For revolver shooters – load all cylinders, facilitate your proper stance, grip, muzzle down range and when you are ready, sound off – “FIRING” and commence your qualifying. You can go through the same steps with all three sets at that distance once you’ve started the first series. For semi-auto shooters – insert a loaded magazine, facilitate your proper stance, grip, muzzle down range and when you are ready, cycle-a-round into battery. At this point you can engage any safeties and/or decoking mechanisms if desired. Then, sound off – “FIRING” and commence your qualifying. You can go through the same steps with all three sets at each distance once you’ve started the first series. Keep your finger off the trigger until your sights are on target and you are ready to fire. ALWAYS keep your firearm pointed down range at all times. Always keep muzzle pointed in a safe direction! Do NOT leave the firing line with a loaded firearm. “Remove Magazines / Show Clear”: When shooting is complete, keep your firearm pointed down range, open the cylinder or lock the slide back and remove magazines, and wait for your instructor to visually inspect that your firearm is unloaded/clear. Leave the slide/cylinder open when exiting the range so the RSO knows the firearm is clear. “Holster or put away your Weapon”: Insert you firearm into your holster or container only when instructed AND only after your instructor has visually inspected and confirmed an unloaded condition. Keep your finger off the trigger when holstering or putting it away. “Range Is Clear”: When the range is declared clear, all firearms have been confirmed clear by the instructor and have been put away. Please wear hearing and eye protection while exiting the range area. 5 rounds with one dominant hand, reload, 5 rounds with two hands, reload and 5 more rounds with two hands. Then, 15 rounds from a distance of 5 yards to the target: 5 rounds with one dominant hand, reload and 5 rounds with two hands, reload and 5 rounds with two hands. Then, 15 rounds from a distance of 7 yards to the target: 5 with two hands, reload, 5 with two hands, reload and 5 more with two hands. Total of 45 shots. On a B-27 target, shooters must make 39/45 or 85% of their shots in the 8 ring or better to pass. 6 rounds with one dominant hand, reload, 6 rounds with two hands, reload and 6 more rounds with two hands. Then, 18 rounds from a distance of 5 yards to the target: 6 rounds with one dominant hand, reload and 6 rounds with two hands, reload and 6 rounds with two hands. Then, 18 rounds from a distance of 7 yards to the target: 6 with two hands, reload, 6 with two hands, reload and 6 more rounds with two hands. Total of 54 rounds. On a B-27 target, shooters must make 46/54 or 85% of their shots in the 8 ring or better to pass. Time limits: There are no stated time limits at the 3, 5 & 7 yard intervals. *If a student is shooting a revolver with a cylinder capacity with more than 6 rounds, I require that they shoot the cylinder full. They will also have to achieve 85% of their shots in the 8 ring or better to pass. Firearms with less than a 5-shot capacity will have to be reloaded at each stage to comply with the 5-shot capacity minimum standards. Now, if you want to sign-up for a class, you need to call us to enroll.